Though announced to start at 10 AM, the event (Times of India’s ‘Bangalore Patrol’ public meet held at Shree Bhagwan Mahaveer Jain college on J C Road, on Sunday, the 28th Nov - ToI report may be accessed here) started only at around 10.45 AM. And, apparently going by the learnings at the meeting on Water-supply & Sewerage issues (on 21st Nov, check this), Mr Balram, the ToI chief editor, and moderator of the show, decided to first ask the panelists to address the gathering, one by one, after a brief introduction by the sub-editor, Asha Rai. That took up all the time, and, even as the clock struck 12, there were two more speakers remaining to give their address. The gathering became restive, and even as Mr H Ravindra, Chairman, BBMP Major Works standing committee, was talking about having completed the foot-overbridge near the Sophia school (Basaveswara circle) in record time, many of them stood up and started accusing the authorities of having constructed something that was totally user unfriendly, and with only the 'ad visibility factor' in mind check this). Even as Mr Ravindra mumbled something in response, Mr Balram sensed the overall mood, and decided to take up the questions from the public. Now, here again, though ToI readers had been invited to send in their questions by mail, there was no talk about them at all. Instead, the questions that were sent in at the venue, on paper slips that were provided by the volunteers, were alone taken up, and selectively. And, with very little time remaining, not many questions came up for discussion, leaving the invitees a lot frustrated. Whatever, Mr Balram appears to have considered my question on what the BBMP was doing with regard to 'the repeat Supreme Court orders to have all places of worship coming in the way of traffic and pedestrians removed/ re-located (check this)' worthy enough to be taken up first. In response, Mr Ravindra came up with the same old excuse that it was a 'sensitive matter'. Even as I wanted to tell him that 'leadersip was all about convincing the people that the court had already gone into all those matters and then issued the orders, and therefore, there was no option other than to comply', Mr Balram had switched to the next question. Ms Swati, Janaagraha: Briefly explainly some details of the exercise undertaken. It's accuracy may be questionable. But, even if it's 50% accurate, it is enough of a set of data, if the powers that be want to start addressing the associated problems. To that extent, the job merits appreciation. Excerpts from the ToI report on his speech (accessible here): Vexed about the frequent traffic jams, the public also suggested a way out through a possible ‘congestion fee’ across the city. “This is a complex issue. It will sure work but we have to introduce a parking fee first. When parking is paid, people will think 10 times before taking their vehicles out. But people are unwilling to pay even Rs 10 for parking their vehicle the whole day even in areas like MG Road. Only after the parking fee becomes a reality can be think of a congestion fee for it makes no sense to charge one for bringing a vehicle onto the road if you then are not going to charge for parking it on the road,” explained Praveen Sood. Well, the case is building up for resumption of parking fee levy. He was all for more buses on the road. “Public transport is always welcome. One bus takes 50 private vehicles off the road.” He admitted that the issue of poor pedestrian infrastructure in the city is a matter of serious concern. But he also pointed out that people are loathe to use the infrastructure that’s available. Asked about people of residential areas taking charge of parking in their locations — a suggestion of Swati Ramanathan’s — he was more than willing to let local area people issue tickets for parking and regulate it themselves after following due procedures. “But it’s not possible for the traffic department to provide them with security,” he cautioned. He felt that if the Brigade Road Traders’ association could take charge of parking on that road, there’s no reason others couldn’t. Does the Koramangala Federation want to take it on? Traders of CMH road were also at the meeting to discuss their parking woes. “There’s no space to park at all. Is this what we get after last three years of adjustment for the Metro? What’s the use of widening it and making it two way with no parking? Parking is critical considering the road is a commercial area,’’ they asked. Sood’s reply was simple, “You cannot have everything: footpaths, two way traffic with buses and parking.” However, he asked CMH road residents to submit a detailed proposal with a feasible solution, that could be considered. Excerpts from the ToI report on his speech: Kiss goodbye to tickets, bus passes and such other routine transactions that add time to your daily commute. Like many big metros across the world, Bangalore starting April 2011 will introduce a single card that can be used across public transport. The common mobility card system envisioned by GoI, in early stages of introduction, will cover BMTC and Bangalore Metro services across city. Shortly thereafter, these cards will also include access to public transport services ‘anywhere across the country’. “It will be a comprehensive package based on GPS-based passenger information system, electronic ticketing machines for conductors, validators and an effective GPRS tracking system to monitor all vehicles,’’ explained BMTC MD Syed Zameer Pasha. BMTC has also entered into an agreement with UTI Technology Services Lltd, to implement the common mobility card. “Presently, there are some clearances awaited from the state government. Once cleared, the system should be in place by April 1, 2011. All 6,000 buses will be covered within eight months to one year,’’ Pasha added. Excerpts from the ToI report on his speech - Bhaskar Rao, commissioner for transport and road safety,readily admitted,”The transport department at the lower levels is very corrupt. Supervision and manpower are our main challenge areas. My department needs 300 motor vehicle inspectors of which I have only 40. Institutionally, we are also poor in road safety. Driving schools also contribute to road safety concerns. They teach the ABC (accelerator, break, clutch) rule, get you a license on paying Rs 1,000 that also turns adds a killer on the road. He is once again harping on corruption in the lower rungs of his department - continuation from where he had left off over a year ago (check this). I can't understand how better the higher rung can be when they have allowed the situation to remain unchanged for so long - in fact, all through his tenure. Adding more inspectors is only going to make things worse. And, as to his complaint about the 'driving school mafia', the question that arises is why can't he use the powers he is bestowed with to put them in their place, instead of narrating his difficulties to us. On top of it all, he went on to say that, between Mr Sood and him, they had recommended to the government to issue an additional 15,000 licenses for auto's to meet the increased demand. The 'Janata' coouldn't take it any more, and many of them rose to their feet questioning the wisdom behind such a move. But, with Mr Balram intervening saying that he was limiting the questioning to the end, Mr Rao got away, at least for then. Eventually, with all the time wastage, the matter could not be taken up for a comprehensive debate, leaving me to write this blog. And, as if all of that was not enough, our friend then went on to reiterate this new-found theory about how BMTC operations need not be profitable, and it should be allowed to expand its fleet and meet all kind of needs, whether profitable or not. Now, this is a theory being bandied about quite a few 'experts' of recent. I would like to challenge it saying that a subsidy regime is required only when other options are not available, and, even then, it should be only for a limited period, failing which you will land up promoting all kinds of artificialities. Here, very clearly, there's the option of efficient operations, which the organised private sector can provide, and as such, the subsidy regime is uncalled for. All in all, Mr Bhaskar Rao's credibility rating is on a continued, and now steep, decline. Excerpts from the ToI report on his speech (accessible here) - Small, localized solutions to solve the city’s parking problems are gaining ground. BBMP’s long-delayed multi-level parking scheme is set to take off on small sites offering parking for about 40 four-wheelers in each location. Thanks for the update. Shows how difficult it is to manage a broad-range public interaction meeting such as this, especially with the sheer quantity of basic issues we face everyday. Irrespective of the outcome, such interactions always have one benefit. Increased awareness. Well, Ashwin Mahesh commented that traffic is due to absence of local schools and hospitals. Government is creating SEZs at the outskirts attracting IT companies to move from city centre to farther end of city. This will result in larger mobility of people, a person who used to travel 5-20 kms have to travel 30-60 kms a day burning fuel, wasting his time as well as office time, some people driving all the way in a big SUV whereas some people using public transport or office transport. This move of creating SEZs without rail infrastructure connecting the location of SEZs are the major traffic contributor rather than schools and hospitals. Can we have a Narayana Hrudayalaya in every area ? Didn't see this much detail in the ToI report itself. Always good to have multiple coverage, and since this was a ToI thing, doesn't look like other news papers have provided any coverage. Good work in trying to assess the wards, should give some kudos to Janaagraha. Well done. Regardless of a few good speakers, speeches and questions, one has to start looking at the futility of these open interactions which are getting harder to manage. The purpose is neither academic/technical, nor administrative (unless BBMP etc used this as a 'formal consultation' like some govt agencies do for token compliance). Netas rarely attend. Babus only plead helplessness, and rarely make any promises or take deadlines. There isn't a magic fix that myself or others have. For all you know, we ourselves will organize such things and take the similar criticism that is labelled above. But unless done for academic/technical purposes, some thought needs to be given to raise the standards and expectations from such "public interactions". I appreciate the stance taken by Pravin Sood on paid parking & congestion charging. Hopefully more people within the administration especially within BBMP buy into this and are convinced they have to make it happen. Finer details can be worked out with willingness. To Bhaskar Raos credit, the automated driving tracks is a first good move against the myriad lobbies that lend to the chaos but its too little. More outcomes are required on prescribing minimum safety standards on vehicles, Omni's with invisible/dim lights and squeaky sirens masqurading as ambulances, Lorries with ZERO tail/perimeter lighting on their backs, multicolor lighting displays in taxi vehicles causing misidentification as ambulances or police vehicles, newer and noisier horn sounds, standards of teaching in driving schools accreditation for the same, retraining the existing inspectors in quality practices, the list is endless. 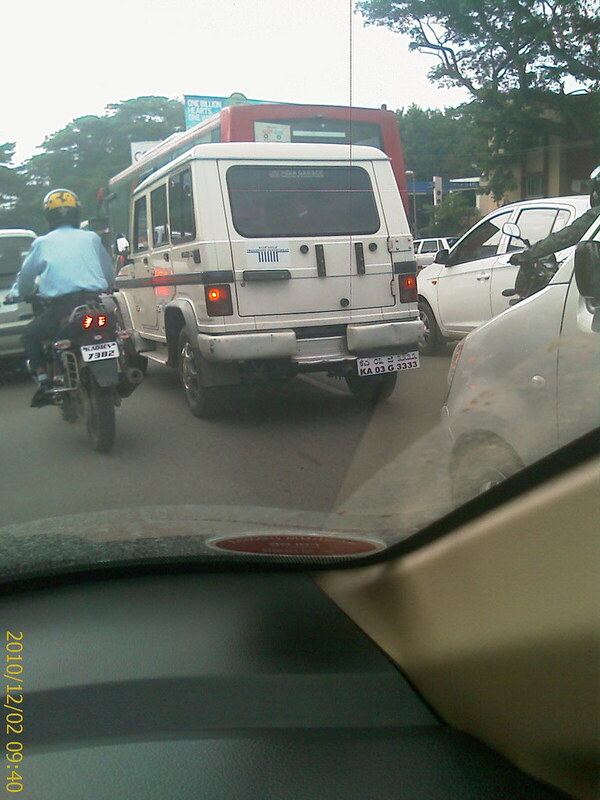 To top it all here is the transport department vehicle straddling lanes and violating rules at cauvery jn. This is todays APAD. Its hard enough to find quality/pedigree people in administration and its dissapointing and a shame when we do have people who are good but they cannot achieve more and take us on the path to better living. Thanks Mr Murali for this report. Long debates at this event, as usual with nothing much to show in the end. Talk, talk & more talk! I think the powers that be have not discussed options such as commuter rail or bus priority anywhere to provide commuters with better options. The only positive is Mr Sood talking about charging for parking. Another important point made by Mr Sood, in response to a query from the floor, obviously with reference to the traffic congestion caused by Mantri Square, Malleswaram, was that in future all buildings above a certain floor area level, will require to get approval of their traffic management plans from the traffic police, simultaneously as applying for building plan approval. This he hoped will avoid the kind of problems Mantri Square is currently being accused of creating. PS: I had overlooked adding this in the original report. Being the techie that he is, I expect Mr Sood would have got a traffic flow simulation video prepared for the Koramangala TTMC, set to be inaugurated soon. Can we possibly collect it from him and put it up here for the benefit of the public? The congestion & chaos that had been caused by Forum mall in koramangala when it had opened was equally bad if not worse.